“Shifting Movements” includes whose photographs of “From Harlem With Love: A Mural for Yuri and Malcolm,” a mural project inspired by the lives, legacies, and deep friendship between Yuri Kochiyama and Malcolm X. “Shifting Movements: Art Inspired by the Life and Activism of Yuri Kochiyama (1921-2014)” will be presented from May 4 to 25 at SOMArts Cultural Center, 934 Brannan St. in San Francisco. Gallery hours: Tuesday through Friday from 12 to 7 p.m., Saturday from 12 to 5 p.m. Opening reception will be held Thursday, May 4, from 6 to 9 p.m. with special performances by dNaga Dance, Erin O’Brien, Tina Kashiwagi and Susan Almazol. Closing reception will be held Thursday, May 24, from 6 to 9 p.m. Featured artists: Susan Almazol, Tomie Arai, Sigi Arnejo, Ellen Bepp, Miranda Bergman, Manon Bogerd Wada, Lorraine Bonner, Karen Chew, Lenore Chinn, Jane Yuen Corich, Reiko Fujii, Antonia Grace Glenn, Isabelle Harada, Bob Hsiang, Alison Ho, Nancy Hom, Barbara Horiuchi, Tina Kashiwagi, Duane Kubo, Lucien Kubo, Nina Kuo, Cris Matos, Alizarin Menninga-Fong, Janice Nakashima, Jane Norling, Genevieve Erin O’Brien, Choppy Oshiro, People’s Kitchen Collective, Shizue Seigel, Malik Seneferu, Pallavi Sharma, Alexa Strabuk, Jess X Snow, Renee Tajima-Peña, Cynthia Tom, Laura Ming Wong, Danielle Wright, and The Yuri and Malcolm Mural Project. Curator: Michelle A. Lee. Jurors: Melorra Green, activist and curator, SOMArts Cultural Center, African American Arts & Culture Complex; Margaret Rhee, feminist poet, new media artist, and scholar (University of Oregon). Asian American Women Artists Association (AAWAA) and the Asian Pacific Islander Cultural Center (APICC) join forces to present this multidisciplinary art exhibition as part of the 20th annual United States of Asian America Festival. 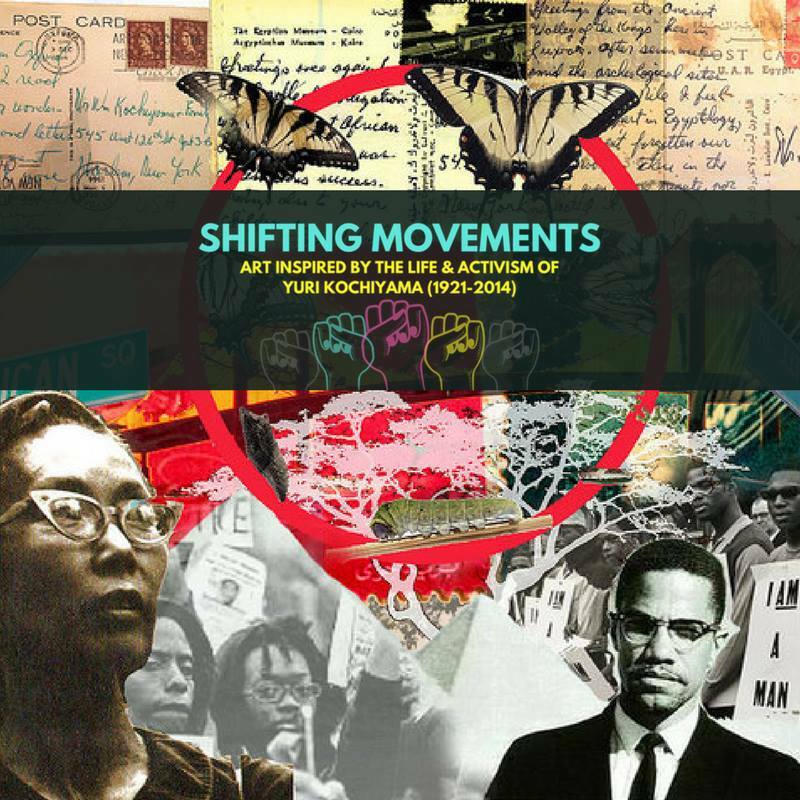 “Shifting Movements” is a multimedia exhibition featuring over 40 artists primarily from Asian American, African American, and Latinx communities, illuminating the legacy of intersectional revolutionary social activist Yuri Kochiyama. The artworks highlight the values and themes that guided her, and the incredibly diverse people, struggles, and movements that inspired a lifetime commitment to fighting for a more humane and just world. Relating Kochiyama’s mission to a contemporary context, artists ruminate on a myriad of urgently relevant topics such as the similarities between the World War II incarceration of Japanese Americans and the festering post-9/11 Islamophobia, the experience of immigrants, refugees and people of color, structural racism and police violence, and the everyday labor that fuels substantive social change. Kochiyama showed up for all who needed help, including African, Asian, Latino, and Native American communities, and inspired artists across multiple cultures and generations. Honoring her intended legacy of inspiring people to “build bridges, not walls,” “Shifting Movements” artists invite audiences to make connections between the past, present, and future – and each other. AAWAA moves beyond the circle of Asian American women artists. Following the inclusionary philosophy championed by Kochiyama, this historically significant exhibition includes talented and powerful artists from multiple generations, ethnic backgrounds, and gender identities. “Shifting Movements” showcases provocatively brilliant art driven by the artists’ abiding passion for social justice. In addition to art, film, performance and literary works, “Shifting Movements” will feature a Kochiyama biographical timeline, oral history recordings, the Smithsonian APA Center online exhibition “Folk Hero: Remembering Yuri Kochiyama Through Grassroots Art,” and a community wall public art installation.